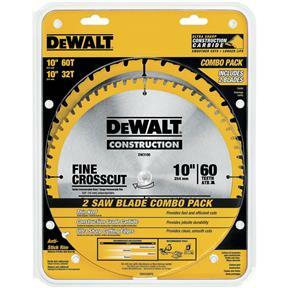 10" x 5/8" 32t, 60t Thin Construction Blades Combo Blade pk. 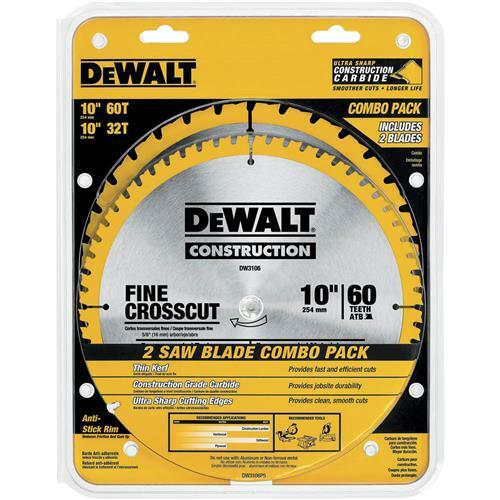 DeWalt DW3106P5 - 10" x 5/8" 32t, 60t Thin Construction Blades Combo Blade pk. This kerf for fast and smooth cutting action. Computer balanced plate reduces vibration for improved accuracy & better finish. Exclusive wedge shoulder design puts more steel behind each tip for increased durability and accuracy. Two great blades for the price of one!